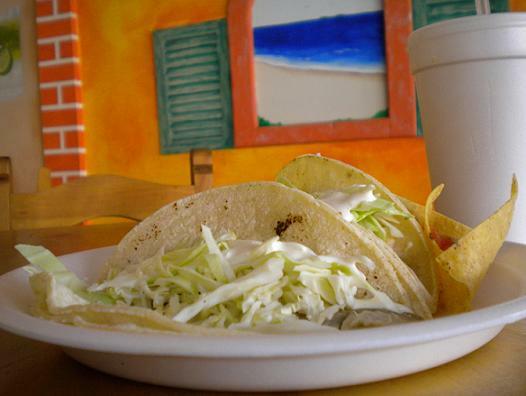 This week’s restaurant: Esther Tacos, 1466 Foothill Blvd. (at Grove), Upland. A lot of taquerias are lovable dumps, while many attractive Mexican restaurants serve crummy food. Here’s a storefront operation — in the Foothill and Grove center, across Grove from Rancho Cucamonga’s Red Hill BBQ — that hits the sweet spot. The service is cheerful, the interior clean, the walls decorated in bright murals and the food inexpensive and tasty. They sell breakfast plates, tacos, burritos, sopes, tortas, soups, and beer and wine. You order at the counter. The al pastor (marinated pork) is dense and smoky, in tacos (99 cents each) or in a torta ($5.99), although the torta bun was crumbly. The fish tacos ($2.49 each) are Ensenada-style, grilled rather than battered. Seating is in oak chairs at oak tables. Brass railings top the dividers. Two walls have murals. It’s a pleasant place. And for better or worse, you’re in the same center as various automotive service shops; I once killed time with lunch at Esther while getting new tires. I told the tire guy I’d be at Esther and he actually walked over to give me a report. Even at the very edge of Upland, it remains the city of gracious living. This entry was posted in Restaurants: Upland by David Allen. Bookmark the permalink.